Here is another really short poem by William Carlos Williams, which I have set to music. In this 40-second song, the entire poem is repeated twice. Play the song and ask students to write down all the words. 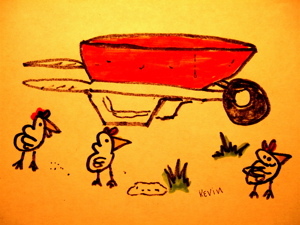 You may want to give them the title “The Red Wheelbarrow” and the word “glazed” ahead of time. Play the song a couple of times. Once students learn the poem, ask them to draw an illustration to the poem. They don’t have to draw well. But the words of the poem form strong images. Most people see a slightly different image. Look at the picture I drew (see the photo above)! Next, students can compare their images. Ask them to create sentences. Things to compare: How many chickens in each picture? Where are? Is there anything else in the drawing? etc. Finally, students can write their own words based on this model. And voila, you are done. A simple imagistic poem!